Several of us have been requesting statistical evidence via their blog that this trend is actually indistinguishable from flat. Dave Brittan has done a sterling job in replying on behalf of the Met Office, but he eventually crafted a complex answer as to whether the above statement made statistical sense. I questioned this statement because I think their quoted error is actually about a factor 10 less than it should be. After waiting 36 hours with my post still in moderation, and with no other posts being accepted I am now presuming that this is their last word on the matter. Frustrated by the lack of response, I decided instead to do the analysis myself. 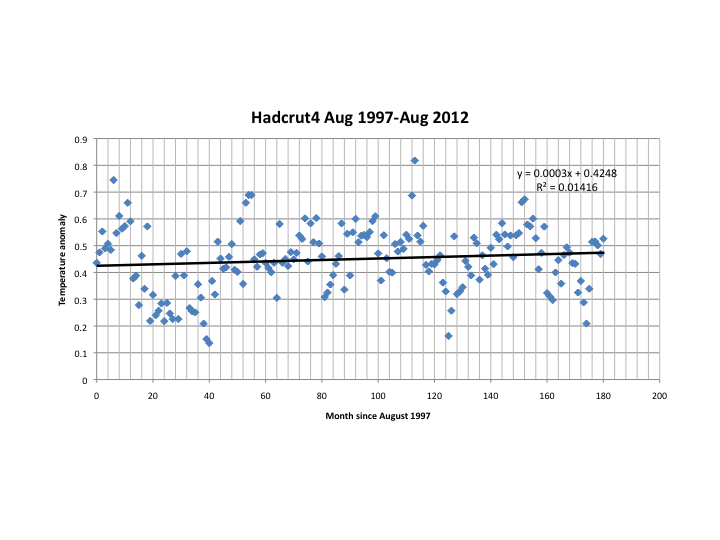 Hadcrut4 monthly Temperature anomaly data from August 1997 to August 2012 (181 months). The fit is a linear regression to the data y=mx+c where xis month number. To convert to trend per decade multiply the slope by 120 (months). The result gives a trend of 0.03 ± 0.02 °C, where the error is one standard deviation (~60% confidence) – so essentially flat. Notice also that the correlation factor R of the data with a linear trend is anyway very poor – just 0.12, demonstrating just how large the non-random monthly variations exist in the data. I am now convinced that the trend is statistically consistent with zero. To emphasize this point, I now show exactly the same analysis done for HADCRUT3 which up to a few months ago was the flagship IPCC data as used in AR4. 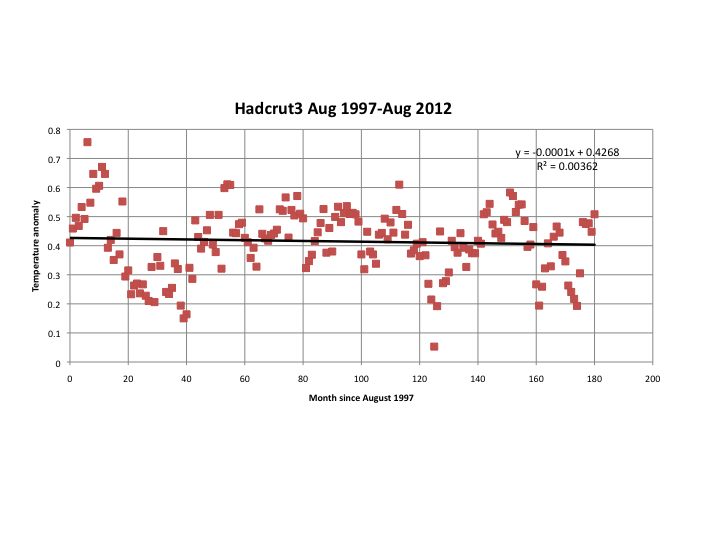 Temperature Anomalies for HADCRUT3 from August 1997 until August 2012. A linear regression gives a negative slope (cooling trend). This is equally statistically insignificant as that for HADCRUT4. The result is a “cooling” trend of -0.016 ± 0.02 °C. To state that the world has “cooled” over the last 16 years is just as meaningless as for the MET Office to claim it has “warmed”. The only rational scientific statement that can be made is that global temperatures have not significantly changed since August 1997. The MET Office should just acknowledge this fact and thereby maintain their scientific integrity. 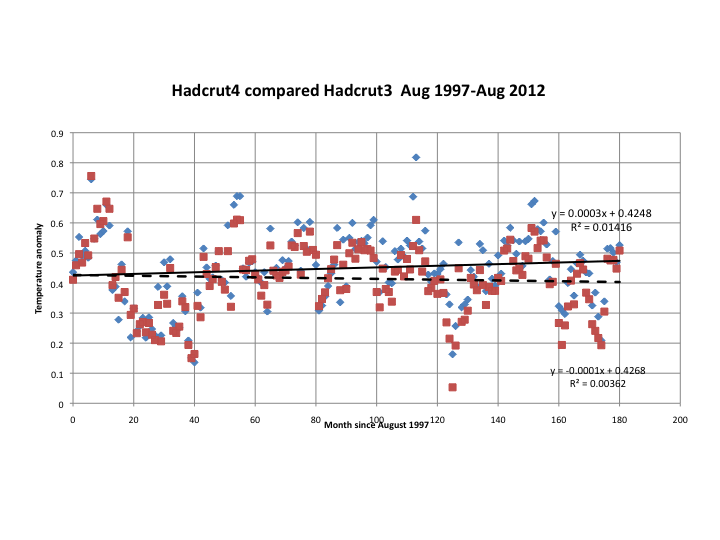 Comparison of Hadcrut4 and Hadcrut3 temperature anomalies since 1August 1997. P.S. The bottom line is that if your eye cannot distinguish any underlying trend – no amount of statistics will ever convince you otherwise. There has been evidence of past warming from the beginning of the 1970s until about 1995. However since then the data clearly show us that temperatures have since remained static. This entry was posted in Climate Change, climate science, Institiutions, Science, UK Met Office and tagged Climate Change, global warming, Staistics. Bookmark the permalink. Pingback: Met Office Statistics Questioned | Watts Up With That? But, but, but, you have to look at the WMO standard 30 year trend, because only 30years equals “climate”. If you do I think you will find that the present HadCRUT4 – 360 month trend is 0.165c/dec, some 17% off its high of 0.199c/dec recorded in in Dec 2003. So why is this planet reducing its warming capability? Especially as we, homo sapiens, are apparently doing our upmost to produce an opposite scenario? Flatter than Les Dawson’s piano. “If you need statistics to prove something, and you have no proof except statistical proof, then what you have proved probably isn’t true. Statistical evidence is the lowest form of evidence there is. Can both statements be true for equally long 15 year periods? Maintain? I suggest some work, first, to establish some. Sorry but there are way to many tricks can be done with the scale of charts, the eye deceives but the numbers don’t. Oe of the upward adjustments in Hadcrut 4 is >0.2 degrees around month 110. How can that happen with data just a few years old ? Generally speaking, for a sign to be attributed with a minimum of confidence to a value it should be at least 3-sigma, and guess what, their original value is exactly 3 sigma. It all boils down to how reliable are their uncertainty estimates (I assume they don’t infer them from the residuals) and how closely their qui square reproduces the degrees of freedom. Are the error estimates part of the data? By the way you should give one extra digit in the uncertainty estimate computed from the residuals. Assuming gaussian distributed errors, the value is accurate to about 1/sqrt(2*number of points), roughly 5% (.001). There seem to be a few outliers so the result should be checked with what one gets from a robust fit to the data. Am I the only one not suprised that HADCRUT4 has an even heavier thumb on the scales than HADCRUT3? I prefer taking the trend from 2001. It just happens to be the “start of the century” and the date the IPCC made their infamous prediction of certain warming, but the real reason I like it is because there is a nice flat bit afterwards, so the trend is very little influenced by the exact date you choose to start. It’s worth mentioning that CO2 levels were only recorded rising from 1958 … that in the 70s they were telling us there was global cooling, so at the best it was cooling or flat till (using 5year average) 1975. So, it is from 1975 that we get the “worrying” global warming. 1997 – 1975 = 22 years of “unprecedented warming”. Now we have 15 years of no net warming and somehow it is insignificant. That 40% of that period with no net warming … and we are the ones they accuse of being “mad”. It’s an upward trend, Jim, but not as we know it. Hi Mr Best, could you settle something for a stats know-nothing. When you say you’re convinced the +0.03/dec trend is statistically consistent with zero, given that the error bars run in both directions, does that also apply in the other direction, ie statistically consistent with +0.06? Or is there some reason it’s so on the low side, but not on the high side? Yes it does. There is no reason to prefer either the low or high side of a single measurement. Likewise you can’t claim any trend exists if that trend is consistent with zero. Clive, I also noticed that HadCRUT3 had a negatve slope in the 21st century. This disappeared when HadCRUT4 came out. They both have a positive slope in the eighties and nineties, before 1997 when the super El Nino started. As far as the slight positive slope of the current HadCRUT4 goes, it is caused by the inclusion of the 1999 La Nina that followed immediately after the 1997/98 super El Nino. It is not easily visible in ground based data but you can see it in in satellite graphs. Ground based time resolution is so poor that you can’t see the full height of the Super El Nino nor can you see the two La Ninas flanking it. Figure 15 in my book “What Warming?” makes that clear. That positive slope of HadCRUT3 in the eighties and nineties is phony because neither satellites, nor GISTEMP, nor NCDC have it. There is nothing there but alternating El Ninos and La Ninas and the mean temperature is flat for 18 years – no warming. NOAA, however, and Hansen’s other temperature curves show a non-existent late twentieth century warming in that time slot. After all, Hansen told us in 1988 that the world was warming and he has to show that warming somewhere. I agree the satellite data have much better time resolution and show clear el Nino & La Nina signals, but their time period is limited. The ground data supposedly cover 160 years of data but I wouldn’t trust values much before 1900 because coverage is very sparse – mostly Europe and the US. The CAGW narrative is based on the 1970-2000 period of warming, and GCM models projections into the future. No political leader now dares to question the AGW orthodoxy and all pays lip service to “tackling climate change” and “curbing CO2 emissions”. In the UK we have the 2008 Climate Change act which now legally binds our government to cut emissions 80% by 2050. The act was passed at the height of the credit boom. Now while our economy shrinks and each family paying $200 each to subsidize wind farms, it all seems like a noble but futile gesture. In now rather looks more like economic suicide, especially since the same green lobbyists oppose any nuclear expansion. Temperatures in UK have not changed for 150 years. China increases emissions each year by more than 100% of total UK emissions. Who will be the brave person to shout the emperor has no clothes? Clive makes an important point. If zero is within the error bounds, then it must be taken as the “Null Hypothesis”, the assumption-to-be-disproven. Zero is kinda magical that way. Where does Clive say that Brian? That actually seems to contradict what Clive said to me and indicates a preference for the low side. Given that the error bars for both Hadcrut4 and Hadcrut3 overlap zero, then no-one can claim evidence of either a warming or a cooling trend in the data. However model predictions of 0.2 C/decade assuming that only enhanced CO2 forcing +feedbacks determine global temperatures are ruled out. My point is that firstly that when we debate warming with the guys on the other team, we need stipulated (mutually agreed) data to argue from, and you can bet that they’re not going to reject HADCRUT. Secondly, the charts you have used here, Clive, have been overlooked by the good guys (us) and are not part of the generally cited data. Good work. PS I’m not a true skeptic, I’m a lukewarmer with a fence picket right up my a55. I welcome warming because a warm planet is a happy planet. I am also a luke warmer ! The greenhouse effect is a scientific fact, but the all the associated hype around CAGW is more political than scientific. I have no worries for planet Earth !